The Scotch has long been associated with exciting play, although people often doubt it�s positional base. But the opening has evolved from the swashbuckling games of the 19th century to become a sound, but aggressive, alternative to the evergreen Spanish. In his first Fritz-Trainer DVD, Parimarjan Negi looks at the latest revolution in Scotch theory that has completely changed white�s plans, and once again brought back the interest of the world�s elite. Negi presents not only the white strategies in detail but also outlines a dynamic way for Black to counter this latest trend. 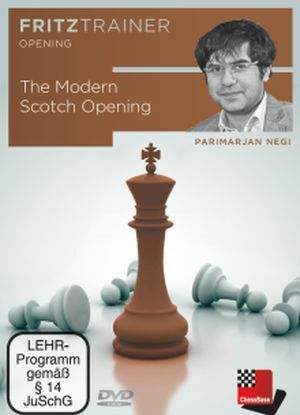 Parimarjan Negi (21) became the youngest GM in the world in 2006, and since then has won many international events, including the Asian Championship in 2012.